Involves relatively long and narrow aeration basins so that concentration of soluble substances and colloidal and suspended solids varies along reactor length. In CMAS, mixing of tank contents is sufficient so that ideally concentrations of mixed-liquor constituents, soluble substances (COD, BOD, NH4-N), and colloidal and suspended solids do not vary with location in aeration basin. With development of program logic controllers (PLCs) and availability of level sensors and automatically operated valves, SBR process became widely used by late 1970s. Sequencing Batch Reactor process is fill-and-draw type of reactor system involving single complete-mix reactor in which all steps of ASP occur. Mixed liquor remains in reactor during all cycles, eliminating need for separate sedimentation tanks. Membrane technology has found increasing application for enhanced solids separation for water reuse and use in suspended growth reactors for wastewater treatment. 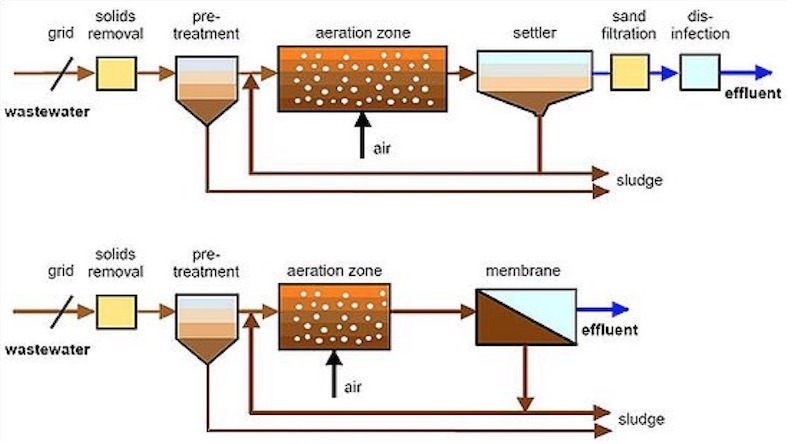 Membrane biological reactors (MBRs) may change look of wastewater treatment in the future.